How Will Obama Help Single Parents? (The Root) — Between now and the inauguration on Jan. 21, The Root will be taking a daily look at the president's record on a number of policy issues, including his first-term accomplishments and what many Americans hope to see him accomplish in a second term. Today: addressing the challenges faced by single parents. See previous postings in this series here. Background: It's widely known that nearly 70 percent of black children are born out of wedlock, and a similar share are raised in single-parent households (which can also result from divorce or the death of a spouse). Many of these kids are doing fine, but as the National Fatherhood Initiative has noted, children living in single-parent homes are more likely to be poor, have emotional and behavioral problems, drop out of school, become teen parents and be incarcerated. They live in households with a median income that is one-quarter that of traditional two-parent households. Women head the majority of single-parent households. Stacey F. Johnson remembers struggling as a single mother to raise three children — a girl and two boys. She worked two jobs, including one as a security guard, to bring in extra money. She couldn't afford child care and sometimes had her 6-year-old daughter take care of her two younger sons, ages 4 and 1, while Johnson went to work. "I was blessed by the grace of God that nothing [bad] ever happened," said Johnson, 48. Johnson started the Association of African American Single Mothers in Sacramento, Calif., 17 years ago. The nonprofit focuses on education opportunities for single mothers and teaches them financial stability and life skills. Her children are now adults, ages 25, 22 and 20. But Johnson still remembers what she faced as a single parent. "It was a challenge," said Johnson. "I had to go the extra mile when it came to being a single mom." First-term accomplishments: The government has a number of safety net programs that help families with housing, food and child care — assistance that single-parent households need disproportionately. For example, using funds from the Recovery Act, the Obama administration expanded the Supplemental Nutritional Assistance Program, or SNAP, to help families with food crises and invested in jobs for disadvantaged youths and low-income individuals. And the administration's Promise Neighborhoods give cradle-to-college services to high-poverty communities. But as the child of a single mother, Obama also knew firsthand the importance of a strong male figure in a child's life. During his first term, President Obama visited churches on Father's Day and talked about the joy of being a father and the impact that dads can have on their children's lives. "The National Fatherhood Initiative comes from the president's own personal experience. It's an issue that's important to him and personal to him," said Michael Strautmanis, deputy assistant to the president and counselor for strategic engagement to White House Senior Adviser Valerie Jarrett. "He grew up without a father in his life. He knows the impact that can have on a child. He's also working to be the best dad he can be to his two girls." Last summer the Obama administration launched a new program under his Fatherhood Initiative called Fatherhood Buzz, an outreach effort on responsible fatherhood using local barbershops throughout the country. Barbershop patrons can receive parenting tips as well as information about job training and healthy living. "It's a way to really connect with fathers and give them access to information that they might need to be better connected with their children," said Strautmanis. In addition, the administration provides grants to help strengthen grassroots organizations with a proven record of having a positive impact on fathers and, through its Fatherhood Champions of Change program, recognizes community leaders who are making a difference in the lives of fathers. "We've seen the impact that the absence of fathers has had on children's lives and on their communities, so we want to make a difference every place we can," said Strautmanis. Second-term hopes: As the economy turns upward, the Obama administration has been working to make sure that the most vulnerable families, including those headed by single parents, have an opportunity to participate in the job market. It has used the Recovery Act to put resources into states that allow them to help single parents find jobs. Last year an estimated 260,000 families on Temporary Assistance for Needy Families, or TANF, got jobs — half of which were summer jobs for youths, said Earl Johnson, director of the Office of Family Assistance at the U.S. Department of Health and Human Services' Administration for Children and Families. "We believe jobs are an important component of being able to stabilize single-parent households," Johnson told The Root. The Health Profession Opportunity Grants are an important program that was implemented last year. Low-income women — predominantly single mothers with children — receive funding to attend classes in the health field at local community colleges. Last year the grants, which are in 23 states, helped more than 10,000 participants become part of the health industry. Johnson says that the goal is to reach more than 30,000 people in the next two years. "We've been aggressively trying to deal with single parents and their children, trying to focus our work so that we improve both the parent's and the child's outcomes," said Johnson. "The mission of the administration is to make sure that the whole family is well and taken care of and also is responsible for its own well-being." 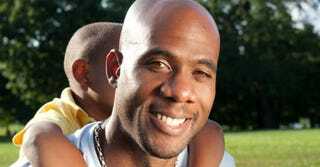 Last year the Obama administration implemented the Healthy Marriage and Responsible Fatherhood Initiative. The program was created with funding from the Claims Resolution Act of 2010, which provided $150 million in grants to community organizations that help couples and fathers. There are 120 grantees, including groups that prepare young people for parenthood. Five grants are awarded specifically to organizations that help formerly incarcerated fathers reconnect with their families and communities. Other grantees focus on job development and education. The goal of the Administration for Children and Families, Johnson said, is to address those challenges within communities that may lead to negative outcomes, such as incarceration, teen pregnancy and school dropouts. "We really are trying to make sure that our programs deal with the single parent who is economically and socially challenged to raise their child," said Johnson. "We're trying to put together a holistic package where our programs can become better integrated in serving them and their needs." Lottie L. Joiner is a Washington, D.C.-based freelance writer.